Self-adhesive vinyl tiles, often called peel-and-stick, are some of the easiest types of flooring to install. The unconnected pieces of tile allow you to make any pattern or design you want, and are more manageable during installation than a single sheet of roll-out vinyl. And because all the adhesive you need is self-contained, there's none of the mess associated with glue-down tiles. Instead, you can quickly and cleanly retile your kitchen floor in a single afternoon. While most stick-on tile comes in a single size, almost any style of tile floor looks great in a kitchen. Remove the molding around the edge of the room, and cover the floor with thin plywood, making sure to stagger the seams. Smooth out the cracks with leveling putty and wait half an hour for it to dry. Sand the seams to make certain that the floor is completely smooth. Lay a tile next to the door jamb to measure the necessary height, and trim the jamb with an undercut saw so that the tile will fit underneath. Repeat on the front casing and other jamb as well. Measure the midpoint of each of the walls, and snap two intersecting chalk lines across the middle of the room, dividing the kitchen floor into quadrants. Sweep the floor clean. Lay the tile, one quadrant at a time, always starting near the middle. Peel off the backing from a tile and lay it down, pressing down on it to make it adhere. Keep laying tiles until there isn't enough space between the tile and the wall to lay another one, and then proceed to the next quadrant. Lay a loose tile directly on top of one of the edge-most tiles, and place a third tile on top of that, sliding it flush with the wall. Draw a line along the edge of onto the sandwiched tile, and cut along this line with a vinyl cutter. 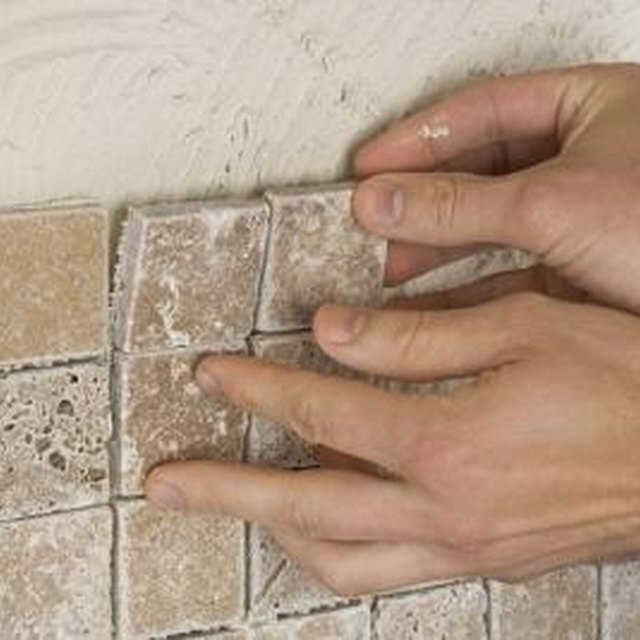 Lay the tile into the crack along the wall, and repeat until the entire floor is covered. Roll a rolling pin over the entire floor to ensure that it's fully adhering, and reinstall the molding. Wait five days before washing the floor, to let it fully cure.